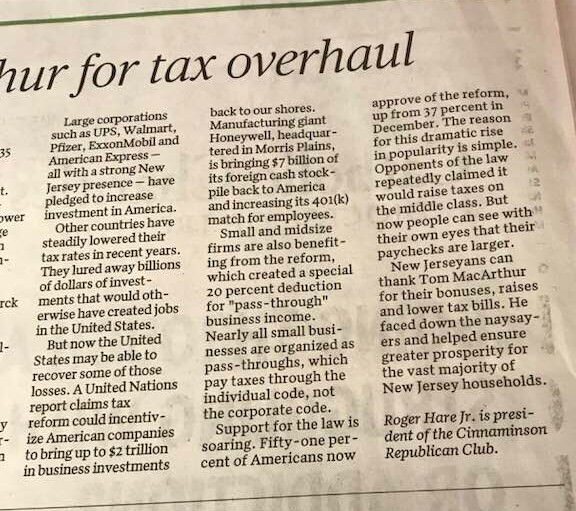 I am responding to the commentary piece in the Burlington County Times June 3, 2018 edition titled “Thank MacArthur for tax overhaul.” (Screenshots of this letter are below.) It appears to me that the author, Roger Hare Jr., lives in a fantasy world. Thanking Congressman Tom MacArthur for supporting a tax bill that has produced negligible results to date and looks to have a devastating impact in the future seems absurd. And also a laughable claim. A Bank of America-Merrill Lynch analysis done in April 2018 found that fewer than 45 of the 133 Fortune 500 companies in America have paid out cash bonuses to their workers. However, the same study found that the amount of money benefiting shareholders has been sizable. In the first three months of 2018, investors received $109.2 billion in dividends, up more than 8% from the prior year. Almost 100 corporations have trumpeted stock buyback plans, adding up to over $178 million in buybacks, the largest amount unveiled in a single quarter in history. Massive spending on dividends and buybacks benefit wealthy shareholders, not the middle class. 84% of all stocks owned by Americans are held by the wealthiest 10% of households. 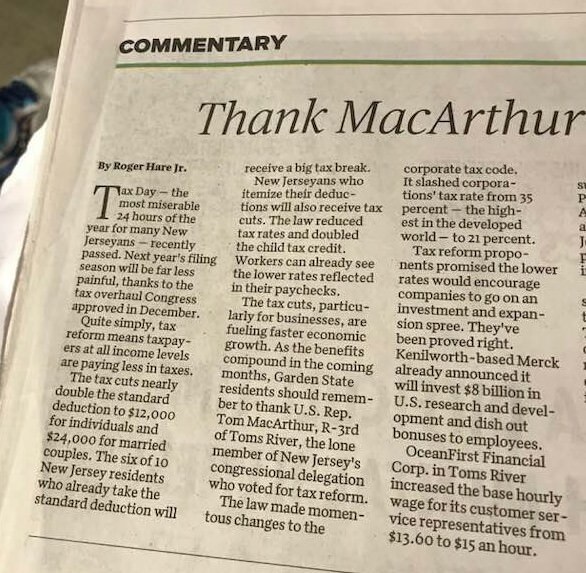 The average constituent of MacArthur’s district is hardly feeling benefits from the “tax overhaul.” There may be a few pennies added to weekly paychecks, but gas prices are up to close to $3 a gallon, food prices are up because of both harvesting and shipping problems, health insurance premiums will be increasing because of the assault on the ACA, and little relief is in sight in terms of costs for housing, clothing, or education. On top of these immediate issues, the “tax overhaul” is projected to create a $1.7 trillion deficit over the next 10 years. A deficit which will give fuel to the Republican idea of attacking “entitlements.” What this means are constant proposals that further erode the security and income of the middle class. We will be looking at proposals to increase the retirement age, reduce increases in benefits, cap medical benefits for the most needy, and put at risk the most vulnerable citizens who have worked a lifetime. For these reasons, no one should be thanking Congressman Tom MacArthur. There is a reason this Congressman was the only New Jersey legislator to support the Trump tax bill. It is a bill rewarding those with the highest income and net worth. It does little to increase security or comfort to the middle class currently, and puts the great majority of citizens at risk in the future. Keeping these facts in mind makes things very clear to me. Come November 2018, instead of “thanking” Tom MacArthur for supporting the “tax overhaul”, I will vote to make sure he is fired! Previous Post: OPINION: MacArthur does nothing to prevent children being taken from their families. How dare you post an opinion letter on CMTV lamenting about the rising deficit! Learn MMT baby! Oh, and THANK YOU TOM MACARTHUR! Grateful for the extra 11,800 pennies I get in my paycheck every two weeks. Didn’t consider that. Need to think of how to handle that going forward.